Have you seen or read about The Phantom of the Opera? Even if you have not, launch Universal Monsters: The Phantom’s Curse Slot at Moon Games to get a better idea! This 5-reel, 40-payline game by NetEnt tells the story of a ghost named Erik who falls head over heels in love with Christine Daaé, a gorgeous opera singer. Erik is also a musical genius who lives in the underground world under the Opera Populaire. You can imagine the intense love story that follows! On the game, get the chance to see the huge opera hall where you can find transparent reels. Symbols you can come across are Christine, the Phantom, Mirror, Ring, Yellow Flower, Dagger, Spade, Heart, Diamond and Club. Immerse yourself into the love story by placing your bet on Universal Monsters: The Phantom’s Curse Slot! Use the + and – signs on the Coin Value and Level fields to set your preferences. With the Max Bet tab, you can go for the highest stake. Enjoy a set number of spins played on their own, thanks to the Auto Play feature! Bet Levels: Opt for a maximum of 10 bet levels. Amount of Paylines Selection: The 40 paylines cannot be adjusted and remain active throughout the game. Coin Values: Pick any of the following coin values; £0.01, £0.02, £0.05, £0.10, £0.20, £0.50 and £1.00. Watch out for the beautiful Chandelier on Universal Monsters: The Phantom’s Curse Slot! It acts as Scatter and triggers the free rounds. With a minimum of 3 scattered Chandeliers on reels 1, 3 and 5, enjoy an unlimited number of free spins! The Free Spins feature is played with each reel connected to the arm of a chandelier. When the Masked Phantom shows up on a reel, the latter is highlighted. When this happens on all reels, the round is over. The Masked Phantom also acts as Wild and is stacked on any highlighted reel. 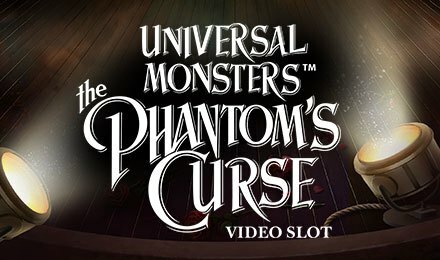 Look for the Mask on Universal Monsters: The Phantom’s Curse Slot! It stands for Wild and replaces any symbol, except for Scatter. During your gameplay, you will notice that other symbols may also act as Wilds. Land the Unmasked Stacked Phantom on reel 1, along with a stacked Christine symbol on reel 5 to trigger the Point & Click Bonus round. It is a picking game which comes with 2 stages. During the first one, select any of the 8 roses to reveal coin wins until a blocker takes you to the next stage. During the second one, pick from 3 mirrors to receive a maximum multiplier of 3x. During this feature, you can win a maximum of 7200 coins! Activate the Masked Phantom Re-spin Feature on Universal Monsters: The Phantom’s Curse Slot with an Unmasked Stacked Phantom found 2 positions high on reel 1, as well as a Stacked Wild Mask on the 5th one. During the feature, all Bonus symbols, Wilds and Phantoms remain in place for a free re-spin during which they act as Wilds. Don’t be shy to enjoy Universal Monsters: The Phantom’s Curse Slot at Moon Games! Get ready for hours of entertainment. Good luck!